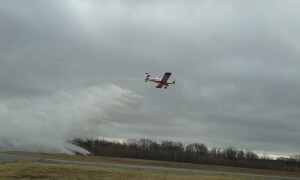 MOSHANNON- A mild winter and dry, windy conditions has wildfire season off to an early start. With several wildfires already on the books, forestry staff, forest fire wardens and volunteer firefighters gathered at Mid-State Airport in the Moshannon State Forest for an informational briefing and demonstration of the Airtractor 802 single-engine airtanker. The aircraft will be officially in service Saturday and will be ready to respond to large wildfires across the state. The plane has an 800-gallon capacity and can extinguish fires from the air, or can be used to keep a fire contained by wetting the area surrounding a wildfire. Those attending the briefing learned the proper procedure for requesting an airtanker attack, what information to relay to the pilot, how to work around the aircraft safely, and what to expect when an aerial drop is coming. The group also reviewed what to do in the event a wildfire crew is caught in the path of an air-drop. Check the wildfire danger level with the local forestry district as well as the wind levels before burning. Do not throw cigarettes, matches or other smoking/burning materials on the ground or out vehicle windows. Completely extinguish any outdoor fires you create with water and dirt. Be mindful when operating any equipment outdoors which may create sparks of heat. If you see anyone burning or participating in any activities which may start a wildfire, be sure to alert the authorities. If a property is found to be responsible for starting a wildfire, they can be made to pay for the expenses incurred to put out the fire.